I love salads. Summer is the perfect time of year for them, too. I live in Colorado and I do not have air conditioner in my home (when we built the house the builders assured us we didn’t need it, they were wrong!!!) so there are several weeks during the hot months that I just don’t want to turn on the oven… A refreshing summer salad is just the way to go! 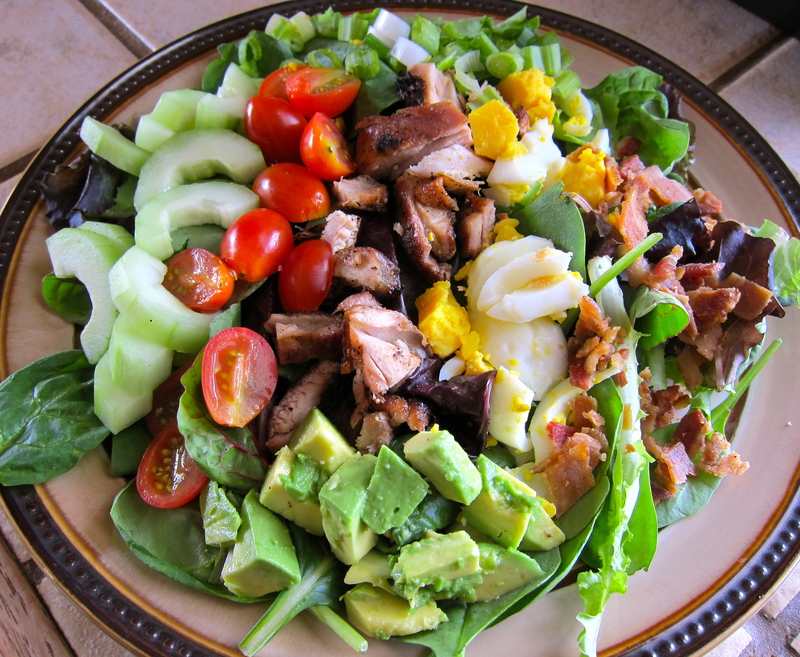 This recipe is adapted from Paleo Periodical. In bottom of large salad bowl, whisk together lime juice, olive oil, garlic, jalapenos and S&P. Add lettuce greens, cabbage, and cilantro. Toss to combine. 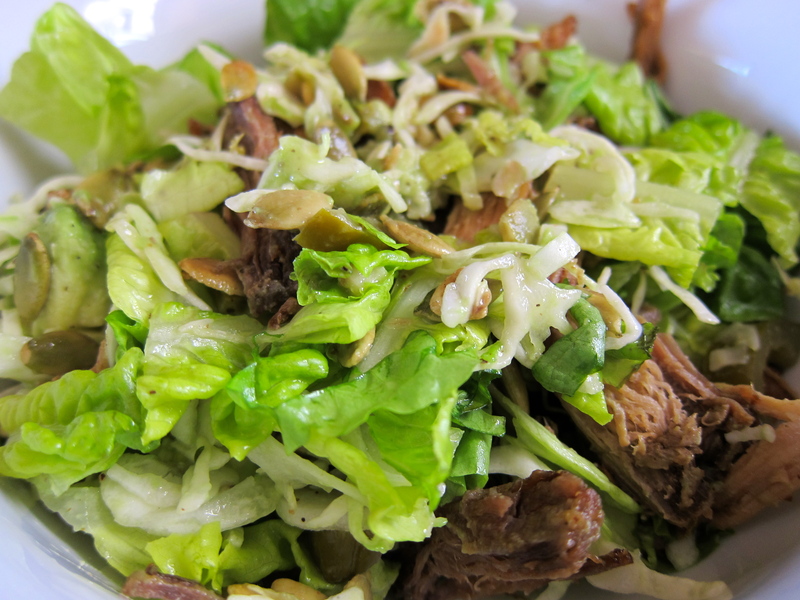 Divide the tossed salad evenly between 4 salad bowls or plates, top with warmed shredded pork, avocado and pumpkin seeds. Enjoy! This recipe adapted from Prevention Magazine. Add shrimp (or other protein), salt and pepper to taste and pine nuts. When the protein is cooked thru remove from heat and stir in vinegar and Dijon mustard. If the skillet becomes too dry add additional fat (bacon grease, coconut oil, or avocado oil). Divide spinach among 4 plates or bowls, evenly top each bed of spinach with onion, mushroom and shrimp. Garnish with sliced eggs and crumbled bacon. 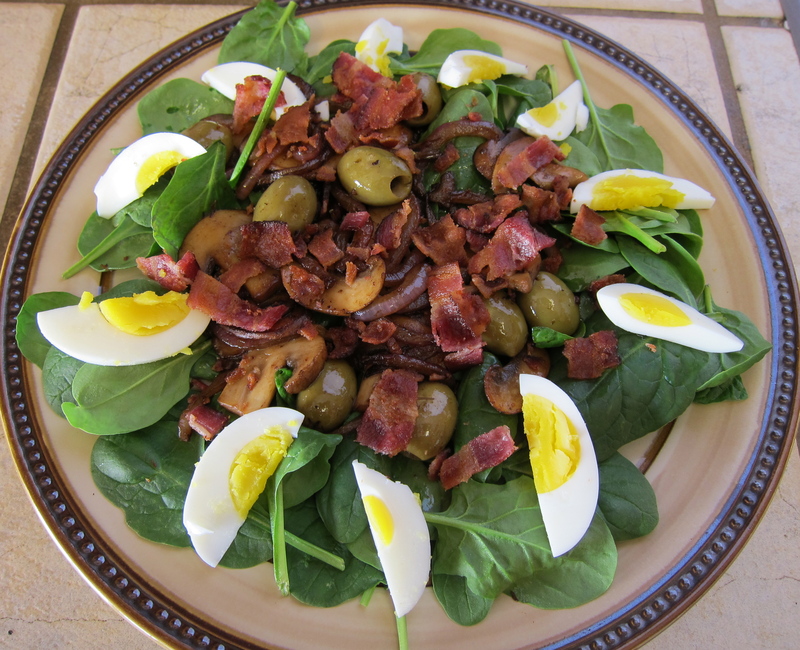 In the salad pictured above I substituted green olives for the pine nuts and left out the additional protein and add more eggs, feel free to adapt the recipe to suit your taste and pantry ingredients! This recipe is adapted from Food Network. Dressing of choice… I like cheater homemade ranch (recipe to follow) or if you eat dairy the traditional dressing for a Cobb salad is blue cheese (recipe to follow). Prep ingredients as instructed in the above ingredient list. In a large bowl toss the lettuce with your dressing, season with salt and pepper and then divide evenly between 4 plates. 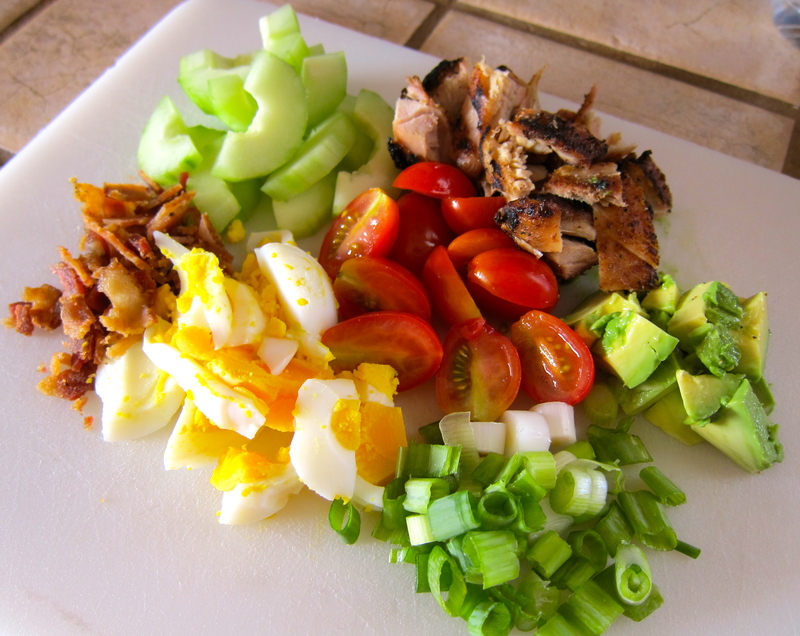 To garnish each salad, make a row of each on top of the lettuce; avocado, chicken, tomatoes, cucumber, scallions, bacon and eggs. In a small bowl combine seasoning and water and allow to set for 5 minutes. After 5 minutes, pour reconstituted seasoning into 1/4 mayo and mix until well combined. Chill for at least 30 minutes. In a medium bowl whisk together the olive oil and lemon juice, season with salt and pepper. Whisk in blue cheese until well combined.